Elizalde was born in Calif., in 1977. After initially entering military service in 1996, he was assigned as an infantryman with 3 rd Bn., 325 th Airborne Infantry Regiment (AIR) at Fort Bragg. He later served as a Long Range Surveillance Detachment team leader with Company D, 519 th Military Intelligence Battalion, 82 nd Airborne Division. In 2004, he was selected to attend the Special Forces Qualification Course at Fort Bragg to become a Special Forces engineer. 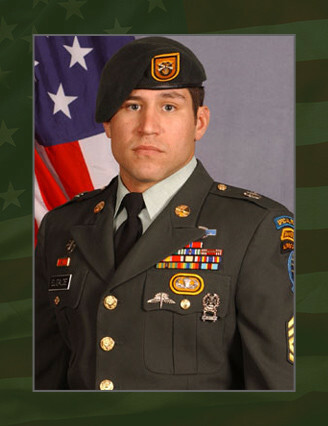 He earned the coveted “Green Beret’ in 2005 and was assigned to the 1 st SFG(A) at Fort Lewis, Wash., in Mar 2006. Elizalde’s military education includes the Warrior Leaders Course, Basic Noncommissioned Officer Course, Combat Life Savers Course, Long Range Surveillance Leaders Course, Basic Airborne Course, Military Free Fall Parachutist Course, and the Ranger Course. His awards and decorations include the Bronze Star Medal, Army Commendation Medal with “V” Device, Army Commendation Medal Second Award, Army Achievement Medal Third Award, Good Conduct Medal Third Award, National Defense Service Medal, Iraqi Campaign Medal, Global War on Terrorism Expeditionary Medal, Global War on Terrorism Service Medal, Noncommissioned Officer Professional Development Ribbon, Army Service Ribbon, Overseas Service Ribbon, Combat Infantryman Badge, Expert Infantryman Badge, Parachutist Badge, Military Free Fall Parachutist Badge, Ranger Tab and the Special Forces Tab. He was posthumously awarded the Bronze Star, Purple Heart, and the Meritorious Service Medal. Elizalde is survived by his daughter, Sydney Grace of Klamath Falls, Ore.; and also by his parents, Jorge and Teresa Elizalde of Renton, Wash.; and sister Rachel Elizalde of Renton, Wash.